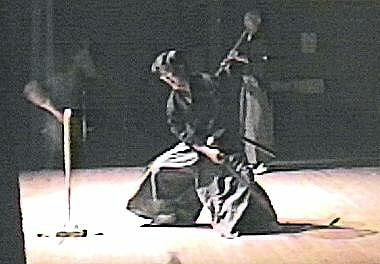 Hōki-ryū is one of the oldest classical traditions of Japanese swordsmanship. Founded in the late 16th century by Katayama Hisayasu*, it is distinguished for its curriculum of iai, the art of sword drawing. Indiana is the only location in the United States where this rare koryū is practiced. Our group is headed by Paul Smith, 4th-dan, who teaches under the supervision of Dr. Nakamura Tetsu*, 8th-dan and hanshi (pictured above doing a test cutting at a public demonstration in Bloomington, Indiana). We are a part of Nakamura sensei's Hōki-ryū organization, called the Kangyō-kai. Our classes are held Saturdays, 3:00 PM - 4:30 PM, at the Yobushin Dojo by Lake Lemon (pictured right), approximately 12 miles northeast of Bloomington, Indiana. Email Paul Smith to make an appointment to observe a class or for further information. * Note that the Japanese names on this site are provided in the Japanese order, last name first. If the characters do not display correctly, please set the web browser encoding to Unicode.